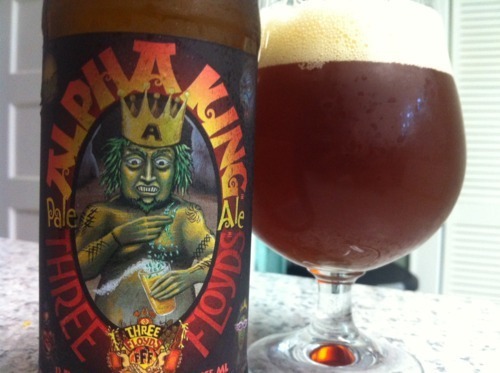 Three Floyds Alpha King | Drink. Blog. Repeat. Back again with another Three Floyds review, this time with an offering in one of my favorite styles: the pale ale. I love IPAs, but there are times when the richness of the beer can be a little too much, especially when you want to enjoy something on the porch during the blazing South Carolina summers. Pale ales can still deliver the hoppiness I’m looking for, but in a drier, crisper package. While it’s not as good as Zombie Dust – one of the best pale ales I’ve tried – Alpha King is still pretty good. Alpha King is brewed with Cascade, Warrior and Centennial hops, which give it a really grassy and citrus-forward hop character. It’s a bit darker for a pale ale, pouring a hazy brown shade of orange. There’s two fingers of a tight-bubbled head on top. The lacing is absolutely gorgeous. It grabs hold to the sides of the glass and doesn’t let go. There’s a great punch of grapefruit on the nose. I got a slight resinous hop character to it with a bit of a pine note on the back. It’s a very floral nose, with hints of lemon, a little pineapple and other citrus. On the front of the tongue is a sort of muted bitterness and some nice carbonation throughout the mouth. The citrus definitely shines through on this one, with some nice grass and pine notes throughout the mouth. There’s a surprising amount of malt on the back end. A really strong caramel note with a kind of bready character sticks to the back of your tongue. Yet there’s still that drier crispness you’d expect from a pale ale.